Card tricks are a fun and easy way to amaze friends and family. This website is for magicians of any skill level looking to learn free card tricks. 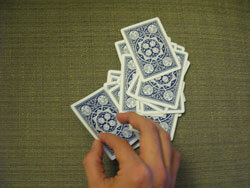 Be sure to check back often since new card tricks are added often! If you haven't already, you can sign up for the newsletter to receive tricks in your email! The spectator finds his card by spelling it out. Find the spectator's card by reading her pulse! The magician predicts the result of randomly mixing cards face up and face down. Make each Ace turn face up, one by one. 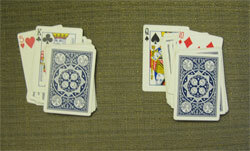 Four cards on the table predict the spectator's card. Find the spectator's card without even touching the deck! Create an "invisible" card, and then make it visible again. The spectator ends up sitting on her card with no idea how it got there! The magician guesses the spectator's card incorrectly... or does he? The greatest magic is the kind of magic that can be done with ordinary objects under ordinary conditions. If a magician uses everyday objects, the only explanation for his tricks is real magic. Real magic is a true gem. It brings hope, joy, and entertainment to all who witness it. Card magic is unique because it not only uses everyday objects, but it also allows a magician to produce a limitless number of effects with a single prop. Card magicians do not have to worry about carrying unweildy gimmicks or spending thousands of dollars on equipment. Finally, card magic is a well-developed branch of the magic community. There are literally thousands upon thousands of card tricks available to learn. However, not all card tricks are good tricks. That is why FalseShuffle exists. FalseShuffle's goal is to provide the best quality card tricks for everyone from beginner magicians to professional magicians. Every trick on FalseShuffle has been tested in front of a live audience and evaluated for impact. As an added bonus, all of the tricks on FalseShuffle can be performed with little to no setup. Learn how to get started as a magician!